Have you ever wondered why you observe some large and at times unsightly decayed knots on the surface of your framing lumber? How can this lumber be graded correctly, especially in No.2 or higher grades? If you do not understand how and why knots in Dimension Lumber are limited, then these knots that appear unacceptable can be a real source of confusion. How are the graders, and now grading machines, grading these knots? Are they grading the lumber correctly? Can you learn to grade these knots? 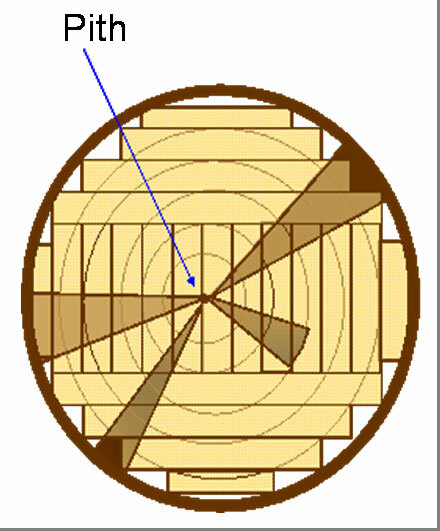 In Dimension Lumber the size and location of the knot within the cross section of the piece is the primary consideration, not how “pretty” the knot is. What you may not understand is that knots in Dimension Lumber are not primarily graded for appearance; they are graded for their effect on the strength of the piece. Dimension Lumber grades are structural grades intended for structural purposes and when the rules were written they were written to reflect this. 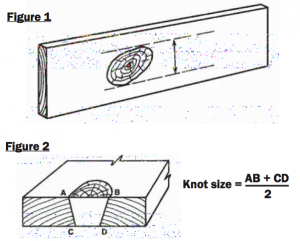 Knots affect the strength of a piece of lumber because they reduce the cross-section of continues fibers along the length and across the width of the piece. Think of a knot as having a similar effect on a piece of lumber as a hole or a saw cut in a piece of lumber would have. It is easy to understand that the larger the hole or the deeper the saw cut, the greater the effect will be on strength, since there will be less wood in the cross-section available to support a load. Knots have a similar effect in that they interrupt, or break the continuous lengthwise integrity of the wood fibers running end-to-end in the cross-section of the piece. Sometimes only a small sliver of a branch will be included in a piece of lumber and sometimes most of the branch or even several branches may be included. The greater the size of a knot or knots contained within the cross-section of the piece, the greater the negative effect is on the strength of that piece. 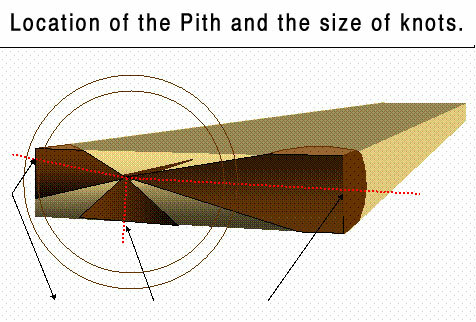 Understanding where the pith is located in relation to the piece is the key to visualizing how the knots are positioned in the cross-section of the piece. The knots in the examples below will look very similar on the surfaces of the lumber, but as you can see they occupy much different space within the cross-section. A, is cut from near the center of the log, while piece B is cut from the side of the log. Dimension Lumber graders must first learn how to measure knots to determine the exact knot size, and ultimately the grade that will allow the calculated knot size. 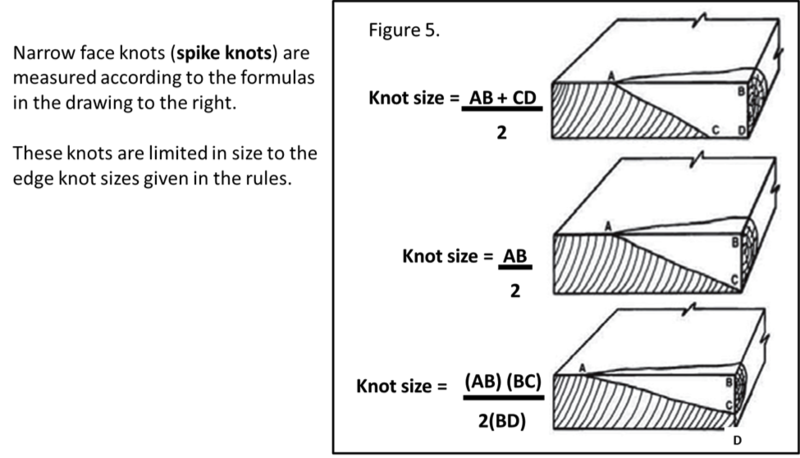 Different shapes of knot are measured differently; however the goal is to calculate the average size of the knot and compare this to the knot size allowed in the rules for a particular grade. 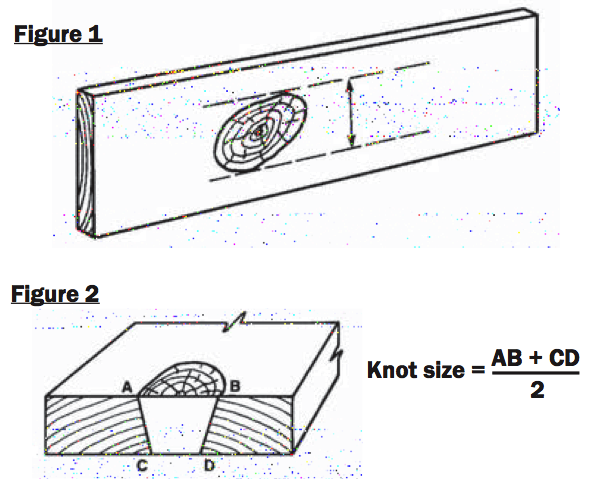 Regardless of the shape of the knot, the knot is allowed as long as the cross-sectional area does not exceed the cross- sectional area of the knot allowed by the rule for its location within the cross-section of the piece of lumber. Knots of different types, shapes and locations are measured differently. For example; Simple Knots appearing on wide faces are measured between lines drawn parallel to the edge enclosing the knot. 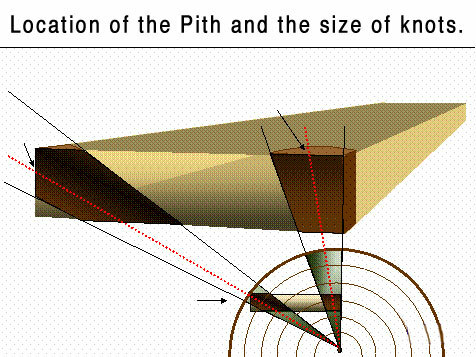 The knot size is equal to the average of the two wide face measurements. After learning how to measure different shapes of knots, graders must also learn the size limits for knots in different locations on the piece, i.e., edge knots, centerline knots, and combination knots. But how do the graders make a decision on all the knots they see without actually measuring every single knot? When Dimension Lumber graders learn how to grade knots on the production line they use a technique called Total Measurement (TM). This technique allows graders to estimate very accurately, without measuring, the size of the knots in the cross-section and to correctly and quickly determine what grade they will make. They learn what parts of the knot to measure and then compare the total measurement that they see to the width of the piece. The TM technique is widely accepted as the easiest and most accurate way to determine the grade of the knot without measuring. Once fully understood the TM method of grading knots can be used by lumber graders and lumber inspectors as well as by the buyers and end users of lumber. Total Measurement (TM) technique is a powerful method to determine the grade of a knot without measuring and now even you can learn how to grade knots this way! this technique by memorizing or referring to a few shot rules. These rules have been condensed and are presented in the SPIB eLearning eBook, “Shorthand Guide”. 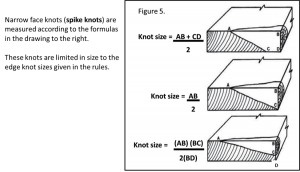 This guide provides a quick reference to all the TM knot limits for grades No.1, No. 2 and No. 3; 2×4 through 2×12, Edge and Combination Knots. We also have these guides for the other grades of Dimension Lumber. The guides can be printed as a pocket guide or used as an eBook on your phone, tablet and/or PC. As a bonus this guide also contains the Shorthand Guide Lines for all the grade rules, limiting in an easy to remember format, each defect and characteristic found in softwood dimension lumber. The SPIB eLearning courses are the only way to learn how to grade Dimension Lumber without spending 100’s of hours in the lumber shed, on the production chain, and/or in the classroom with an experienced grader trainer. So if you want to understand and grade knots in Dimension Lumber, then take the SPIB eLearning Course for Dimension Lumber and download our free eBook, “Shorthand Grading Guide” to carry a pocket guide reference on the job. Total Measurement (TM) technique is a powerful method to determine the grade of a knot without measuring and now even you can learn how to grade knots this way!